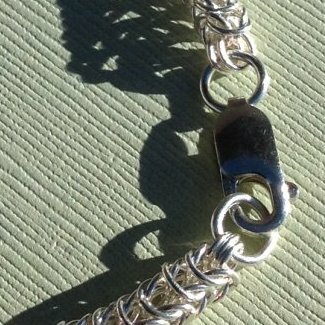 This sterling silver chain bracelet proves that chainmaille jewelry can be beautiful. It's the most beautiful piece of jewelry I make. Handmade with the Rondo a la Byzantine pattern, which I modify slightly for a better look, this all sterling silver bracelet is fine jewelry. This bracelet has a lot of silver in a dense weave, sure to catch the light. As a 0.75-inch-wide cuff, it is very comfortable and pleasing to wear. Matching choker: See the choker here. 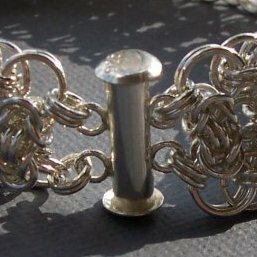 I entered this bracelet in the 2016 State Jewelry Competition, held at the State Fair. This is the second time I won first place for one of my bracelets: I also received the blue ribbon in 2015 for the Viperscale bracelet. 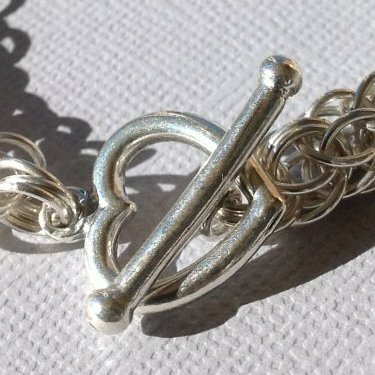 This sterling silver chain bracelet proves that chainmaille jewelry can be beautiful. It’s the most beautiful piece of jewelry I make. Handmade with the Rondo a la Byzantine pattern, which I modify slightly for a better look, this all sterling silver bracelet is fine jewelry. This glamorous sterling silver chain bracelet has a nice, dense inner weave, and the outer pattern has a beautiful lacy look. This chainmaille bracelet has just enough weight that you will know you are wearing it, but it’s not heavy enough to be uncomfortable. This silver bracelet grace a woman’s wrist and will attract many, many compliments. Matching choker: This bracelet has a choker to match, with the same weave styles. See the choker here. At 7.25 inches length (shown) and 0.75 inches wide, this bracelet has 1.88 ounces of Sterling Silver, which is A LOT of silver. However, that weight is well distributed across the bracelet, so it is comfortable to wear. It feels very, very nice–very pleasing weight. If you want to get really dolled up, email me to order this in 14K gold fill. It will blow you away! Popup: Policies on ordering, delivery, repairs, and returns.